The design revolution that began at Lexus several years ago has reached a new milestone with the introduction of the all-new Lexus LC, a beautiful luxury coupe that will now assume the role as the aspirational vehicle for the Lexus brand. 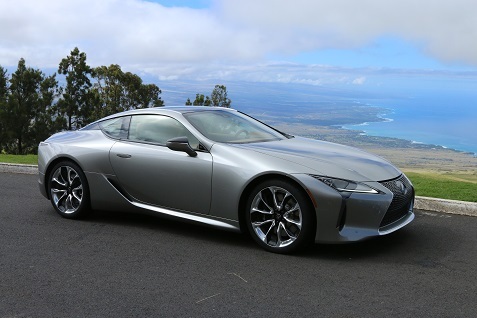 I had the opportunity to drive the new vehicle around the Big Island in Hawaii, which was a perfect setting for this powerful and luxurious car that looks like a big hit for Lexus. The LC grew out of the Lexus LF-LC, which was a true concept car that debuted at the 2012 North American International Auto Show in Detroit. The effort to bring this vehicle to market resulted in an entirely new platform called GA–L (Global Architecture – Luxury), which also forms the foundation for the all-new 2018 LS flagship sedan that will be released later this year and will underpin future front engine/rear-wheel drive Lexus models. The platform was designed with a lower center of gravity to aid agility and driving pleasure and to enable more alluring vehicle designs. Take a look through the photos in our slideshow and you’ll see how Lexus has further refined its design language with the LC. The now familiar spindle grille dominates the front end, but that design cue now flows through the entire vehicle and accentuates the back end as well. It’s a beautiful design that is worthy of the halo vehicle role that the LC was intended to fill. In the front, you’ll notice the independent, L-shaped daytime running lights beneath new ultra-compact triple LED headlamps that create the distinctive LC front lighting signature. The tri-dimensional rear lamps also contribute to the distinctive look of the rear end. The LC is beautifully sculpted from every angle, as you can see in the photos. You’ll immediately think of comfort and beauty as you sit in the new LC. The vehicle has a wide stance, and you’re sitting low to the ground, but driver comfort and easy access to controls is certainly at a premium. The design also places the driver’s hip point as close as possible to the car’s center of gravity for maximum feedback while driving. The luxury and craftsmanship of the interior is evident as soon as you sit in the driver’s seat. The first vehicle we drove had a silver exterior coupled with a unique “Mid Brown shade” interior. It gave a feel of some of the luxury interiors from an older time but in a good way. The stunning red LC we drove had a more conventional but still elegant and comfortable black interior. That said, the rear seats are pretty much just for show, as it’s hard to imagine there being enough room for most people in the back. The LC 500 uses the same engine as the RC F and GS F models – a 5-liter naturally aspirated V8, with this version achieving output of 471 horsepower and 398 lb.-ft. of peak torque. It also features an all-new 10-speed automatic transmission. The LC 500 can go from zero to 60 mph in less than 4.5 seconds. I certainly had fun seeing what this engine could do, and having driven the RC F in the past, I was more than happy to experience the LC as well. The growl of this engine and the responsiveness will please even the most demanding driving enthusiasts, particularly in the SPORT S+ drive mode. I was also struck by the manner this vehicle gripped the road around turns, as the low center of gravity and wide stance certainly made a difference in the driving experience. With the LC, Lexus has certainly achieved its goal to create a vehicle that joins the elite group of international grand touring coupes. The LC is a head-tuner, and it drew interest from onlookers every time we parked the car. It also has a powerful performance engine to back up its eye-catching design. The LC is a clear winner and we enthusiastically recommend it to anyone who has the opportunity to be shopping in this market segment. It arrives at dealerships this spring with an MRSP of $92,000 for the LC 500 and $96,510 for the LC 500h with a new Multi-Stage Hybrid powertrain.